Microsoft has just released version 4.0 of its free anti-virus utility, Microsoft Security Essentials. Since MSSE's release in 2009, its effectiveness, speed and features have been well-received. As a result, the anti-virus program enjoys a great deal of popularity in the U.S. and remains a TechSpot Editor's Pick along with two other solid, free AV offerings: Avast! and Avira. 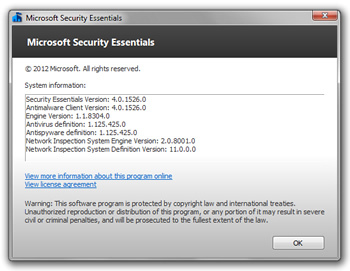 This update to Microsoft Security Essentials is part of the standard product update release cycle. This service update contains product enhancements to improve performance and user experience. We have improved on Microsoft Security Essentials' Automatic Remediation, which will automatically quarantine highly harmful threats without prompting the user to take action as well as minor bug fixes in set up, malware remediation and other areas." In beta since late 2011, the final release of MSSE 4.0 brings users a familiar but updated interface and "enhanced automatic remediation". In plain English, this means MSSE will now immediately quarantine files that it believes are high-risk, rather than waiting for user intervention. As we have all discovered by now, anti-virus utilities aren't absolutely correct 100 percent of the time, but this feature aims to limit the amount of damage done during the lag time between the introduction of a dangerous file and the user's reaction. Spynet, which was introduced with Windows Defender in Vista, has been replaced with MAPS (Microsoft Active Protection Services). However, there is no indication this is more than just a name change for the community-based detection service. The latest release of MSSE is supposed to be pushed out automagically through the Automatic Windows Update service. However, based upon past experiences of others and myself, major MSSE version upgrades have remained a manual installation-only affair. Current MSSE users, especially using 2.0 or earlier, should consider upgrading manually. Also, in order to install MSSE, your installation of Windows must pass the Windows Genuine Advantage validation. If you're running a pirated version of Windows -- as always -- you do so at your own peril.